There is so much to see in our area, you may need to stay a week! I (Helen) enjoy small towns, their unique history and architecture as well as the beautiful landscapes. We have information at the front desk on the “big cities” like Louisville and Lexington which we highly recommend. But since you are here in a small town, we thought you may be interested in other small towns in central Kentucky. Have fun! Walk from the Inn through the historic district to the nearby downtown area. 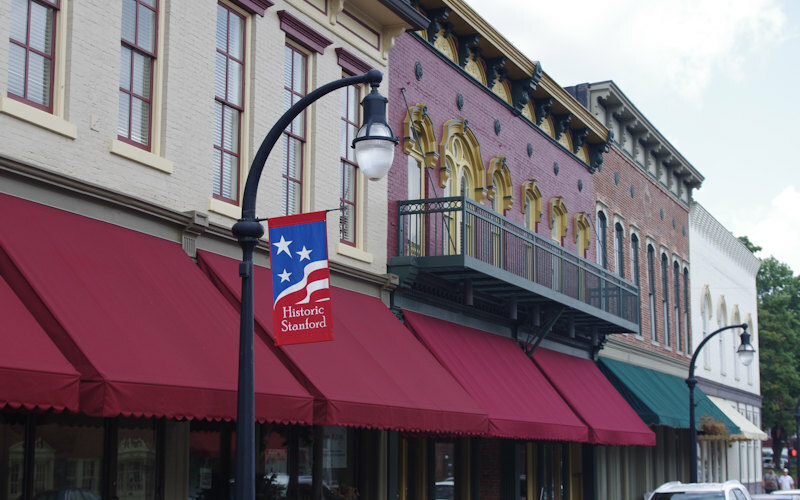 Read more about Harrodsburg. Danville is located just 9 miles south of Harrodsburg, take US 127 S, and turn right at the Danville sign onto Maple Avenue. Read more about Danville and Centre College. This 72-mile stretch of US 31E and US 150 travels through six communities as it winds its way through the knobs of Kentucky. The corridor passes through the communities of Hodgenville, New Haven, Bardstown, Springfield, Perryville and Danville. This corridor exhibits significant historic and cultural resources around every turn and embraces a set of four historical themes: Abraham Lincoln, US History and the Civil War, Bourbon Heritage, and Religious Heritage. For more info, go to the Lincoln Heritage Scenic Highway website. Also in Boyle County is the town of Perryville, just west of Danville , which is most noted for the Battle of Perryville State Historic Site. (Read more about Perryville.) One of the bloodiest battles of the Civil War was fought just 15 miles from Beaumont Inn. The site now is reputed to be one of the most pristine battlefields in the country because development, etc. has not destroyed the view shed or the site. The museum is well done. (Look for the quote from W. C. McChord, Helen’s great-grandfather.) If you are up to it take the walk with brochure in hand to get a fascinating insight to this battle which was mainly fought over the quest for water. Open April-October, Monday-Saturday, 9-5, Sunday 1-5. Perryville has several pre-Civil War buildings throughout the small town, many on US68W. Just a few miles west of Springfield is Lebanon. General John Hunt Morgan went through Lebanon during the Civil War burning and destroying after his brother was killed in 1863. Many beautiful homes were rebuilt amongst the wonderful landscape. This is a sweet town full of shops, restaurants and weekly music events on the square during the summer. The Civil War Park and National Cemetery, 1867 is one of the oldest in the United States. Bardstown is the home of My Old Kentucky home State Park. The home is known as Federal Hill, a beautiful Georgian Colonial mansion build in 1818. It was the home of Judge John Rowan whose cousin, Stephen Foster, wrote Kentucky’s state song, My Old Kentucky Home. The home has just been refurbished and is gorgeous. Costumed guides give the tours daily. The grounds are so peaceful and beautifully landscaped you may find yourself singing the state song as you visit. Bardstown is one of the few small towns in Kentucky that has a historic preservation officer. As you drive or walk around Bardstown you will appreciate their work. Wonderful architecture from all periods has been preserved. Off the courthouse square, you will find many shops, a wonderful bookstore, and restaurants. Close by is the Kentucky Dinner Train, Kentucky Railway Museum, and the Museum of Whiskey History. All fun and interesting sites. Many claim to be, but Hodgenville is sure it is the home of Abraham Lincoln. This town has done a lot of “sprucing up” because of the Lincoln Bicentennial, 2010. Here you will find the Abraham Lincoln Birthplace National Historic Site, The Boyhood Home, the Lincoln Statue, Boy Lincoln Statue, and the Lincoln Museum. It is a great little town with some nice shops and restaurants and if you don’t know enough about Lincoln after you leave you didn’t pay attention! US127N to Bluegrass Parkway towards Elizabethtown. At Bardstown, take exit 31 E to Hodgenville. Irish Acres Gallery of Antiques display 32,000 square feet of American and European furniture, glassware, china, crystal, silver, linens, dolls, jewelry, rugs, accessories, and international gifts. The gallery truly offers something for everyone, from the serious collector to the curious browser. To say that Irish Acres is just another antique shop would be a big understatement. A trip to the fine gallery of antiques could be a fantasy experience in itself. Created from the old Nonesuch Elementary School, Irish Acres also houses its own in-store restaurant, The Glitz. The restaurant more than lives up to its name. It’s all black and mauve and sparkling – with curlicue mirrors and metallic silver accents. The only illumination is from candles, twinkling strands of white lights, and overhead bulbs wrapped in big puffs of crinkled cellophane and outlined with grapevines. Shaker Village appeals to a variety of people. Preservationists, historians, antique collectors, craft enthusiast, experienced travelers, food lovers, shoppers, boaters and naturalist, and just simple seekers of peace and quiet will all make themselves at home at Shaker Village. See our Shaker Village Guide. Directions – From the Inn, turn right onto US127 north to Bluegrass Parkway, east to the Versailles (KY 33) exit. Follow KY 33 to U.S. 62 north to Midway. Midway is approximately 35 miles from the Inn. All the good words fit Midway. It’s a small, friendly, quaint, unique town…but there is much more. The spirit of Midway makes it very special and a fun place to visit. Shopping in Midway is a strolling event. Clothing stores, restaurants, gift shops, a charming Inn, a florist, country groceries, and of course, Midway’s many famous antique shops. All of this within several blocks. A railroad company built Midway over 150 years ago and the still active train tracks divide the main street of town. A walk around the town or a drive around the breath- taking countryside displays the rich architectural heritage of 176 buildings on the National Register of Historic Places. Nearby Midway College is a standout and Kentucky’s only women’s college. Just outside the city limits are the lush, rolling Bluegrass pastures that are home to some of the most valuable thoroughbred horses in the world. Bistro Labelle, 117 East Main Street, Closed Monday & Tuesday, Lunch Wednesday through Saturday 11:30 a.m. – 2:00 p.m.
Directions- From the Inn, turn left onto U.S. 127 south. Follow U.S. 127 south to Danville. At Danville, take KY 52 east to KY 21 south to Berea. Berea is approximately 45 miles from the Inn. Historic Berea, where the bluegrass meets the mountains, is a living celebration of the Appalachian culture. Read more about Berea. The community is the home of Berea College and the famous Boone Tavern Hotel. Berea’s Appalachian heritage is preserved and reflected in its numerous studios, galleries, and craft shops. Here, shopping is a delightful surprise! Both the works of local craftspeople and the Student Crafts Program of the college are displayed for sale. You’ll find delicate mountain dulcimers, beautiful modern living room furniture, hand-woven textiles, fine pottery, and hand-forged wrought iron. In local woodworking shops, skilled artisans turn native black walnut, cherry, and poplar as well as exotic woods into products ranging from decorative bowls and children’s toys to original furniture. Designer jewelry, corn shuck dolls, stained glass, candles, handmade brooms, baskets, patchwork quilts, and colorful needlework are other treasures available in Berea. Also, antique lovers find delightful, affordable treasures in over a dozen antique shops and malls. One other cultural attraction in Berea is the Appalachian Museum which features a slide show, exhibits of regional antiques, old musical instruments, and seasonal exhibitions. Berea is simply a unique American experience. Directions – From the Inn, turn right onto U.S. 127 north. Follow U.S. 127 north to I-64 west to Shelbyville. Shelbyville is approximately 50 miles from the inn. Shelbyville is home to the world-renown antique and gift gallery, Wakefield-Scearce, and several downtown antique malls – offering browsers hours of unlimited shopping. Specialty shops grace most every corner and curve, downtown. There are many other interesting places to see in our area. You just can’t see it all in one trip, you must come back, do some exploring, tell us what you liked, what you didn’t. Give us more suggestions for day trips and enjoy the Bluegrass and Crossroads of Kentucky!